Question of the Week – When it comes to lipstick, what’s your go-to finish (shimmer, creme, satin, matte, etc.) and why are you drawn to that particular finish? Answer: – I don’t have a go-to finish. If I like the lipstick, I like the lipstick. The first thing that draws me in is the colour. I’m an uncomplicated woman! (mostly). 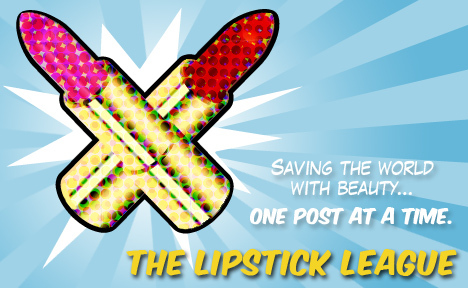 Gouldylox Reviews – Makeup Wars are my favorite posts. This week’s war is all about facial masks. Was your favorite a winner or did it get defeated? Lipglossiping – wants to know all about the last foundation you fell in love with. Come on over and share your sweet story of faux-skin perfection! My Beauty Bunny – When the days heat up, many automatically reach for the lip-gloss. This summer, go the nontraditional route with a matte pout! Check out our round up of the best on the market; Matte Lips Make a Cruelty-Free Splash. Nouveau Cheap – reviews the new Revlon Lash Potion Mascara and has a tip for you, in case you’re thinking about giving it a shot. Pink Sith – is giving away some very cute and colorful Tweezerman Tweezers and Unbreakable Mirrors just in time for Spring! Prime Beauty – has curated a selection of 6 feminine and sophisticated fragrances complete with elegant falcons perfect for Mother’s Day. She’s even giving one away! You’re welcome. Phyrra – shares her Mother’s Day Gift Guide. You’ll want it all for yourself! Vampy Varnish – likes that the new Orly Mash Up collection for summer 2013 is literally a mash up of colors and finishes! Beauty Junkies Unite – If you have a sweet tooth, don’t miss the L’Oreal Miss Candy Collection! Don’t have a sweet tooth? You just might after this review! Clumps of Mascara – is giving away a $125 gift card and a ton of Eucerin goodies for an at-home spa experience! EauMG – has paired perfumes with popular women’s fashion trends for Spring/Summer 2013! It’s also EauMG’s 5 year blog anniversary! So, don’t forget to join in the celebration and enter the giveaways! Guest Post of the Week, as chosen by Gouldylox Reviews – I’ve said it before and I’ll say it again. I love Hair Romance. Although I don’t know Christina, her blog is one of my all time favorites. Almost everything I’ve learned about long hair styling (in the one year I’ve had hair long enough to work with), I’ve learned from her. Did I mention I like this blog? Do you have a preferred lipstick finish? I really love the look of lipgloss, but cannot stand the feel of it. I usually wear a matte lipstick as a base and then a creme or sheer lipstick over it. That way, it really stays on and still has that ‘glossy’ look.